The Skinny: One long chase sequence with fighting interspersed. This is not a great film by any stretch of the imagination, but it manages to be entertaining. by Kozo: Cheap-looking flick from Cheung Man and Wong Jing reteams them with the future of martial arts action stars: Zhao Wen-Zhou. Sadly, their last collaboration made the future seem bleak. This new effort doesn’t really bring much promise, but at least it isn’t god-awful like the filth that was Body Weapon. In fact, Fist Power proves to be an entertaining little flick that succeeds due to lack of pretension and a relentless pace that aids matters. Zhao is Brian, a mainland security officer who’s visiting Hong Kong and becomes embroiled in the plight of Chau (Anthony Wong). Chau is an ex-soldier who’s stepson is being repossessed by his ex-wife and her evil husband Chiu (Lung Fong) who couldn’t care about the kid. They need the boy to secure an inheritance, and the cops won’t help Chau. Desperate, he holds a school hostage until the cops retrieve his kid. 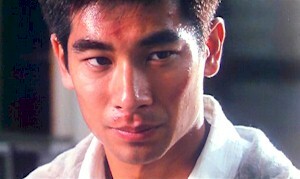 Brian’s nephew is one of the hostages, so Brian takes it upon himself to find Chau’s boy and bring him back.